The aroma of something can trigger memories or bring back thoughts in your mind that can alter a person’s emotions. Certain candles, fresh laundry, perfumes, coffee, and cooked meals can take me back to a specific time and/or place wanting to go back to that moment. What is one of your aromas that evokes a pleasant thought in your mind? When thinking of our five senses our smell is something that doesn’t require you to see the object or listen for a sound. Simply being in its presence will allow you to make the connections. 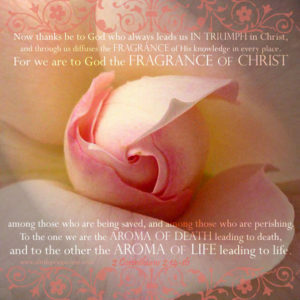 So in 2 Corinthians 2:14-16 I reflect on “the aroma of Christ” Paul talks about and how our actions will give a “fragrance” that can be pleasing or send a person running. When referring to the “aroma of Christ” the truth is at times I can stink! No matter how many candles I burn, how much Febreaze is sprayed, cologne used, the smell comes through. 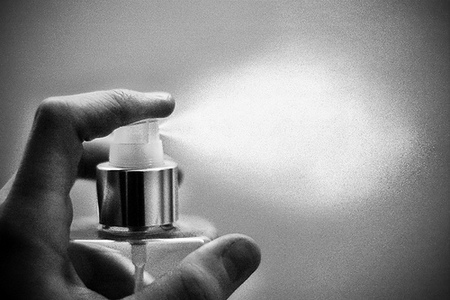 Unless my thoughts, words and actions genuinely reflect Jesus this temporary aroma can turn out to be a foul fragrance that would clear a room. When doing things my way or not showing genuine love this sweet perfume I should always have can repulse even myself. So I ask as “the aroma of Christ” what perfumes do I carry? What perfumes do Christians carry when they enter a room? What words am I using to allow a natural fragrance of life in Christ attract those around me like a bee to a flower? 2 Corinthians 2:16-17 our perfume shared through the message of Christ and our action will cause a reaction in others to stick around or leave. We attract others by His love and the love we have for Him. Not only are our lives an impact aroma but our prayer life is as well. Revelation 8:3-4 allows our sweet-smelling prayers to be lifted to God. Ephesians 5: 1-2 says to be Imitators of God and walk in love. That Christ sacrificed himself so we could live out of love. Proverbs 27:9 says that the oil and perfume make the heart glad. So the sweetness to others is from our genuine counsel. Dear Lord, We know that our Christ like aroma can have an effect on others. We pray for our words and actions are from genuine love like you give us even though we don’t deserve it. We pray that through our sweet aroma of You we attract others who want to know and be around you more. We pray Lord that you shape our thoughts and actions to exemplify and give off a fragrance of being close to You.